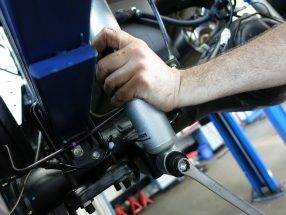 WA Suspensions is looking for an enthusiastic mechanic to join the team. Interest in suspension work, lift kits, coilovers and wheel alignments will get you to the front of the list. We work on everything from classic muscle cars to 200 Series LandCruisers, all quality brands, must have WA repairers licence and attention to details. Drivers license not essential, we are close to the train at Glendalough. Call Stu on (08) 9444 0500 or email me a résumé, stu@wasuspensions.com.au. Most late model 4x4 Japanese utes come out of the factory with the rear end noticeably higher than the front. To eliminate this factory rake lots of people like to raise the front of the car 40-50mm, to do this we often fit a new pair of front shock absorbers and raised coils. If you're mechanically minded you can do this at home with a pair of our pre-assembled front legs. 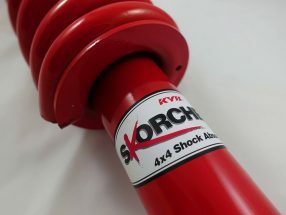 You receive a pair of front KYB Skorched 4 shock absorbers, KYB raised coil springs (made by King) assembled with a brand new pair of strut mounts. Models available - ML / MN / MQ Triton - Medium duty BT-50 / PX Ranger - Medium and heavy duty D40 Navara (except V6 diesel) - Medium and heavy duty Colorado / D-Max - SOLD OUT HiLux - SOLD OUT RRP - $785 25% off until stock runs out, that's just $585 for the pair! To order please message us, email at wasus@wasuspensions.com.au or call on (08) 9444 0500. Delivery available. Have you lifted your D23 Navara but have found it doesn't quite handle as good as it should? Well, Roadsafe 4WD and Blackhawk 4x4 may just have the answer! Starting with the ADR compliant Black Hawk Upper control arms (UCA4981N), these fixed position upper control arms are not only stronger than original but the repositioned ball joint adds an extra 3 degrees of caster to give the car more precise steering, something that diminishes the higher you lift the car. Then we move onto the Roadsafe adjustable Panhard rod (APR017). This easily adjustable unit will help to square the back end up, keeping the diff located in the middle of the car. This is important to keep your track even front to rear. We then finish the kit off with Roadsafe heavy duty lower trailing arms (TANAV23B). These arms are 42mm in diameter and have a wall thickness of 5.5mm making them much stronger than the original. These arms help to keep the rear end in line and stop the car from walking around, keeping everything going nice and straight with confidence. 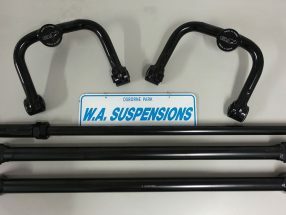 UCA4981N - $799 APR017 - $295 TANAV23B - $298 pair We are offering all of these parts in a special WA Suspensions handling kit (WASUS-D23) for $1,250! For more information or to place an order please contact us via PM, email at wasus@wasuspensions.com.au or on (08) 9444 0500. Delivery and installation available if required. WA Suspensions are excited to be involved with ‘XYZ’ coilover suspension brand. XYZ (est1998) is a leading Asian manufacturer and supplier of high-performance coilover suspension kits. Being a coilover kit it allows you to adjust the height and shock dampening to your ‘I want’ requirements. Only a few simple adjustments and your vehicle goes from street to track specifications. 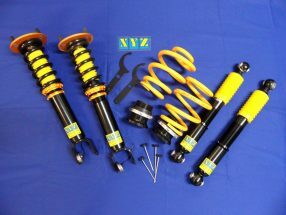 XYZ have coilover kits available for Australian, Asian, and some European vehicles. Our well-skilled mechanics have already fitted a few kits to vehicles that have been road tested and have received extremely positive feedback. Call WA Suspensions for a quote on a new ‘ XYZ ‘ kit (from $1650) or just a chat for some advice about what is best for your vehicle.